The recipe I’m offering comes from Yerchanig Joy Callan, wife of Roy Callan, Executive Director of Camp Haiastan in Franklin, MA. Her recipe is one of the dessert selections in the recently released cookbook, “Armenian Cuisine: Preserving Our Heritage”, from St. John’s Armenian Church, Southfield, Michigan. Joy suggests cooking the fruit separately from the other ingredients and adding it when cooled to keep the pudding's appearance an appealing pearly white. Joy also confided that the longer the pudding sets, the thicker it becomes. To loosen it up a bit, stir in a little simple syrup (the kind you drizzle on paklava) before serving. This dish is a MUST-have at any Armenian Christmas (January 6th) celebration. PS: Don't forget: According to our friend Ara, tonight, Jan. 5th, you should be serving Nevik - Swiss Chard with Chick Peas! 1. In a 6-quart pot, combine wheat and water. Bring to a boil for 5 minutes. Cover and let rest overnight. 2. Remove cover. Return to simmer. Simmer gorgod until water begins to thicken. The lower the simmer, the “whiter” the pudding will remain. After about 1 ½ to 2 hours of simmering, add the sugar and continue to simmer. The pudding will begin to take on a thicker consistency. 3. While wheat is simmering, combine fruit, pistachios and pine nuts in a small saucepan with water. Bring to a gentle simmer and allow to cook for about 15 minutes. Thoroughly drain. Add to pudding when pudding is cooled so that fruit will not bleed color into pudding. 4. Pour into serving bowl. Garnish with filberts, slivered almonds, pecans or walnuts and cinnamon. 5. Pomegranate seeds should either be incorporated into pudding uncooked or served separately as a garnish. There is a similar recipe in Alice Antreassian's cookbook. She recommends that you peel the pistachios in order to maintain the color of the pudding. She also suggests to arrange whole blanched almonds in the form of a star on top of the pudding. Incidentally, in Aintap, we do a simpler form of the pudding using rice. It is very simple: Per cup of water, use 1/4 cup short-grain rice, 1/4 cup sugar, 1 clove, 1/2 stick cinnamon, a little bit of honey (mostly for color). Cook until the rice is soft and starting to fall apart. Place in a bowl and let it cool. Garnish with almonds, walnuts, cinnamon, etc. (Note: I put the proportions from memory; I will double-check and correct if necessary). Out of curiosity, is Mrs. Callan's family Bolsetsi? My mum used to call a yogurt soup Abour. Which was made with yogurt and dill. I was brought up with Armenian traditional precipices, and this version of Apour was not one of them. This must be the Westernized version the sweet version not the savory one. 'Abour' means soup, which could be either sweet (as in Anoush Abour) or savory (as in Tahn Abour). It isn't a westernized recipe. I love Anoush Abour...i had no idea it was such a lengthy process. I was hoping to make it when i get home to have tonight! Oh well...thanks for the recipe! Pari Gaghant! "I am from a "mixed" marriage; Yozgatzi and Gesaratzi. 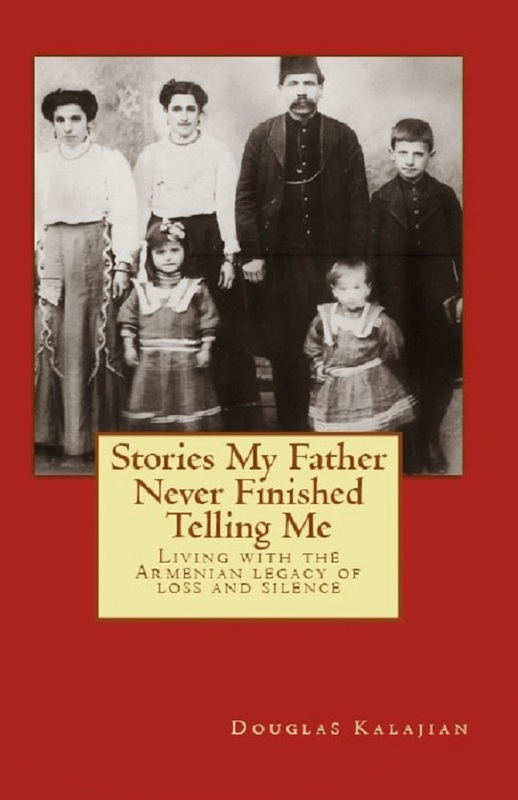 But, lucky me, as my husband's family reminded me on several occasions, I married 'up' as his family is Izmirzi." NK, if time is of the essence, try Ara's recipe above using short-grain rice. It sounds similar, but without the lengthy time factor. Karin, thank you for your encouraging words! Adding rose water to anoush abour would make it super-tasty. I am Kesaratsi, Aintabtsi, from Izmir, from Yozgat - please stop and getb a reality check. No one can say they "are from" western Armenia and Anatolia any more. Food is a convenient reminder of our roots but no substitute for the real thing that has vanished....Otherwise love your site. If you believe that, then yes we are vanished and don't have a case! For a moment it occurred to me that this was a non-Armenian voice speaking. We are talking about our roots here, roots that so many people go to great lengths to find out. It is an identity, not lost, because we remember and never forget. It is recorded and engraved history being told, in writing and word of mouth. My father comes from Hadjin, and mother from Kilis. They all have sad stories to tell. Can I ever forget that? 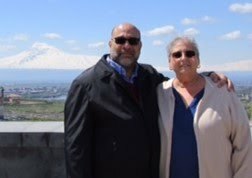 unfortunately within the armenian community one always says whether they are from western or eastern countries first.largely due to fact that where we come from effects the way we speak , cook and follow certain traditions. especially in Los Angeles one boasts about lebanese armenian , hayastansi armenian, persian armenian restaurants , bakeries, churches or stores. I add rosewater at the end, too. Also, it adds a dimension of taste to the wheat if you throw a couple of whole cloves and a stick of cinnamon into the boiling water. 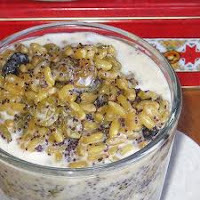 A friend from Sivas makes it with pearl barley. After boiling, she runs the barley through a food mill or sieve and then adds the fruit, so it's more of a smooth pudding or compote. There are so many national variations of this food, often served at Christmastime and other winter feasts: Kolliva in Greece and the Balkans, German and English farina puddings with raisins, kutia wigilijna in Poland, payasam or shira in India. I suspect it is an ancient food. Someday I would like to create a cookbook with nothing but anoushabour recipes! im going to add cloves next time i cook it... im sure it will taste great , i sprinkle cinnamon on top. anoushabour is simple yet so tasty... ive had kolliva but its dry . but you are right a lot of cultures have this dish. if you create a cookbook i will be the first to buy, good luck :) you can add different flavors such as orange water instead of rose.i dont want to try it because i dont like orange in food. All delicious variations! Thanks, all, for your informative comments. That's what this website is all about! My Godmother Angele made the most delicious Anush Abour in Morningside Heights when I was growing up. It had a certain consistency to it and could be spooned or ladled as is and she would add cream or kaymak to it. I could never get enough, of my Godmother or her Anush Abur. Chris, Do you - or someone in your family - have your Godmother's recipe? We'd love to compare and share it! Ask 10 people and you'll get 10 different responses. In my opinion, Anoush Abour should be creamy and somewhat thick - like pudding, not soup. The gorgood (dzedzadz) should be soft, but not mushy, and provide a lovely texture in addition to the dried fruit and nuts. I hope this helps. Good luck and Merry Armenian Christmas! I recently made nevik with black kale instead of swiss chard. It may not have been traditional, but my God it was yummy! Also, for tanabour, if you can't find shelled wheat, you can always use pearl barley. An Adanatsi version uses bread dough. You make the dough, spread it out pretty thin (about 1/8 in), then cut into small squares about 1/2 inch across. You fry half the squares in oil and boil the other half. Combine the two at the very end, then add the yogurt. I actually like it better than the version with shelled wheat, although it is a pain to make. Almost forgot. In the Adanatsi version, they also add crushed garlic at the end (so it is still raw). thanks for allt he hael!im useing this for a school project on Armenia.thanks agian. oh my goodness that should be help! Good luck on your project, Lauren! I'm Armenian living in Romania and I just wanted to share the way my grandmother used to serve anoushabour. First she used to boil the wheat into a thick soup (with sugar, dried fruits like raisins or apricots, vanilla and cinnamon), then put it in bowls. On top she used to add a thick layer of roasted flour, another thick layer of sugar and another one of chopped walnuts, everything sprinkled with cinnamon to taste. She used to make this for New Years's Eve and Christmas and I also plan to prepare some in a few days :) I assume it is one of the many variations from the anoushabour recipe. Put the meat into a large pot and cover with water. Bring to a boil and simmer for about 3 hours or until meat is tender. Skim and discard the foam from the surface; add more water if necessary. Remove bay leaves. Adjust seasonings, if necessary. To serve: place in individual soup bowls and garnish with chopped herbs. Serve with crusty bread. Hi Sara, As hard as I tried, I have not yet found an anoush abour recipe which specifically represents either Tomarza or Sivas. Try the recipe above; I'm sure your family will approve! Shakarshee - another Armenian Sugar Cookie!